2Stock is Coming - Are You In? You've probably noticed these signs around the neighborhood. 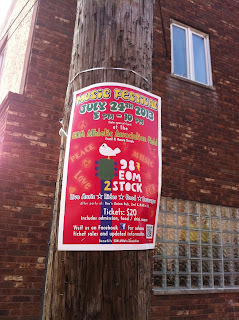 They're on just about every lamp post and are now featured on the large digital billboard on Water Street. EOM and the IBEW Local 98 are getting together to bring you the 2Stock Music Festival - an evening of live music, food, and fun on Wednesday, July 24 from 4pm to 10pm down at the baseball field on Front and Moore Street. Tom Betteridge, EOM 2Stock Music Festival Coordinator, explained "EOM 2Stock is more than an event about helping charities. It's an opportunity to bring the neighborhood back together again and celebrate live music." There will be two outdoor stages featuring a mix of neighborhood legends, national acts, and local recording artists looking to bring live music back to Pennsport. Tickets are $20 and that gets you admission a coupon for food and drink. Kids 11 to 19 are $10 while those under 10 years of age (with an adult) are free. The first 300 kids (with paying adult) will receive a 2Stock panda bear - so bring the whole family. The indoor stage will feature Broadway renditions performed by local and national high school kids. The Independent School of Rock and Musically Speaking of Our Lady of hope will be rocking out inside as well. It's no secret that Pennsport has taken its lumps recently with the uncertainty surrounding AVI and the closure of Abigale Vare Elementary School. "Two Street needs a shot in the arm," added Betteridge, "we're hoping 2Stock can be just that." Following the performance of special guest New Sound Brass Band, there will be a Two Street parade (complete with music and umbrellas) to the after party at Doc's Union Pub and 2nd and Mifflin Street. Before you ask, there is no word on whether Johnny Doc will be rockin' the stage, yet. Tickets can be purchased at The Music Spot on Front and Snyder Sts. during regular business hours. Be sure to check their Facebook and Twitter pages for any additional info. Think Tank: How Would You Repurpose eModa?